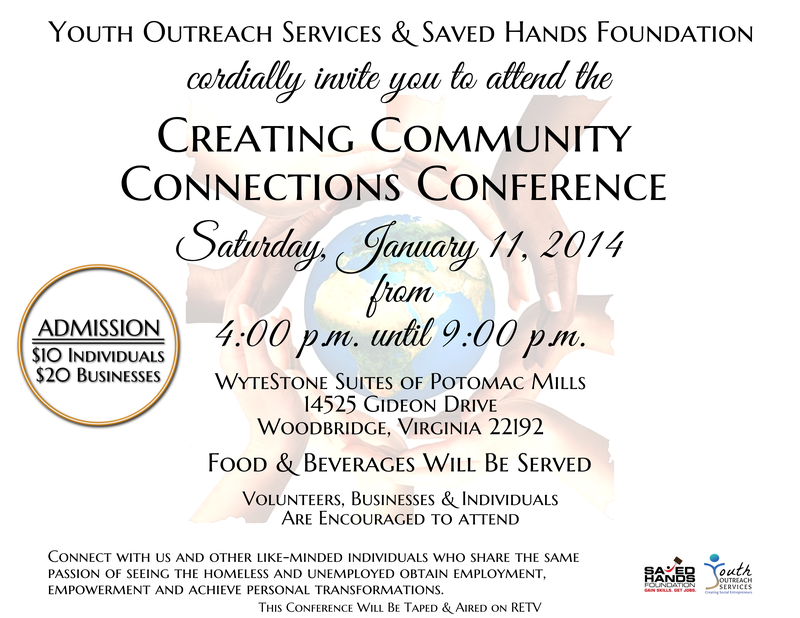 Youth Outreach Services has partnered with the Saved Hands Foundation to host the “Creating Community Connections” Conference at the WyteStone Suites of Potomac Mills at 14525 Gideon Drive, Woodbridge, Virginia 22192. The conference will begin at 4:00 p.m. and end at 9:00 p.m. We hope that you will join us, as local businesses, volunteers and individuals gather together to connect with one another. Our hope is that everyone gathers in one accord to see the homeless and unemployed obtain employment, empowerment and achieve personal transformation. During the conference, Elizabeth Charity will honor those who worked so hard to pull together our First Annual Fall Festival. We truly hope that you plan to attend and share this invitation with others. The cost of admittance is $20 for businesses and $10 for individuals. This price is per person. Food and beverages will be served. There is limited space available for this conference, please RSVP to yosservices@gmail.com if you plan on attending to reserve your seat! You may also RSVP on our Facebook page. No advance tickets will be sold, everyone must pay at the door. Please bring business cards, a bright smile and warm fellowship. We look forward to seeing you there! This entry was posted in Events and tagged Community, Community Networking, Connections, Woodbridge Virginia. Bookmark the permalink. can u please send me the flyer.